20 shoes found. Page 1 of 1. Black sandals, leather upper, lining and insole, leather sole. 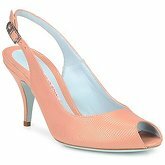 Pink sandals, heel height 7.0cm, leather upper, lining and insole, leather sole. 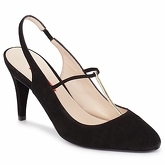 Black/gold court shoes, heel height 10.0cm, height of upper 10.0cm, leather upper, lining and insole, leather sole. White court shoes, heel height 12.0cm, leather upper, lining and insole, leather sole. Curry sandals (also available in Black / White), heel height 9.0cm, leather upper, lining and insole, leather sole. 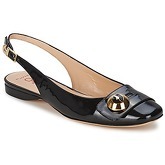 Black/white court shoes, heel height 13.0cm, leather upper, lining and insole, leather sole. Mink sandals, heel height 10.0cm, leather upper, lining and insole, leather sole. Black/white sandals (also available in Curry), heel height 10.0cm, leather upper, lining and insole, leather sole. Black/sable sandals, heel height 11.0cm, leather insole, textile upper, leather lining, leather sole. Sable sandals, heel height 10.5cm, height of upper 6.5cm, leather insole, textile upper, leather lining, leather sole.